Given that you’ve had to wade through some rather wordy offering lately, I’ll keep this simple: mayonnaise is evil, wrong and bleh. 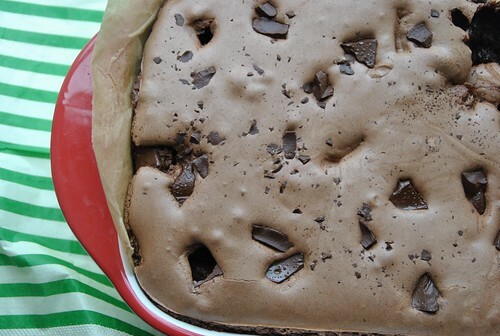 Mayonnaise brownies are lovely, gooey and yummy. I find myself willingly buying mayo as a result. Odd. Pre-heat the oven to 160°C. Lightly grease a 23cm square cake tin and line with baking paper. Sift the flour with the baking powder and cocoa. Put the chocolate into a heat proof bowl over a saucepan of hot water and leave until melted (alternatively, microwave on medium power, stirring occasionally, until just melted). In a large bowl, whisk the eggs with the sugar and vanilla until slightly thickened. Whisk in the chocolate mixture. Fold in the flour mixture, mayonnaise and finely chopped walnuts. Pour into the prepared tin and bake in a pre-heated oven at 160°C for about 35-45 minutes. Thanks to Unilever for sending me a truck load of Hellmann’s mayo. Mr B is very happy. I am taking it as a challenge to find ways of baking with it and therefore turning bad into good. I’m entering these into We Should Cocoa as the theme is ‘New Year, New Ingredient‘ and I’ve definitely not paired chocolate and mayo before! Its is hosted by Chocolate Log Blog and Lancashire Food. It’s a strange concept isn’t it! I baked brownies with mayo a couple of years ago and had trouble getting my head around it, until I tasted them!